Reviewed by Skinz on Aug 23, 2015. “This is a must have extension. It was/is the first extension I added to my site. Why because every other extension subsequently installed gets logged and you receive an email showing what database tables have been added or changed / modified since the last email. The daily sales summary is a fantastic bonus as well. 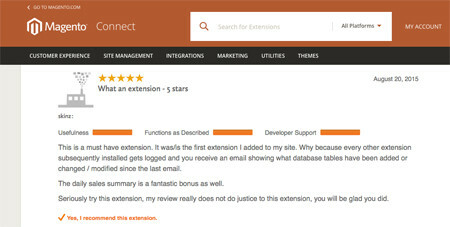 Seriously try this extension, my review really does not do justice to this extension, you will be glad you did. Yes, I recommend this extension.